If you are experiencing problems related to damp in your home, it is important that you read the symptoms correctly. 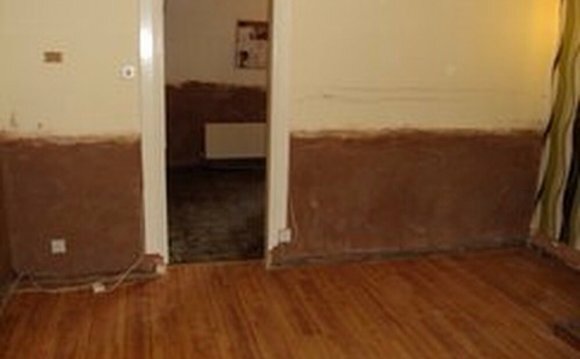 There are various causes of damp, but one of the more serious underlying problems is rising damp. This is caused when moisture from the ground rises vertically up through fine pores in masonry or brick walls in a wick-like fashion, which in hydrology terms is called capillary action. Water can rise up the wall to a height in excess of 1.5 metres. Once this happens, the moisture affects the plaster in internal walls which is highly absorbent. As ground water contains dissolved salts, when the water evaporates, these are left behind in the wall and on its surface. Sulphates: These appear as a floury crust on the wall which is unsightly, but do not cause any damage. Nitrates and chlorides: These 'hygroscopic' salts absorb moisture from the atmosphere and are invisible. Unless these salts are removed, even if the underlying cause of the rising damp is dealt with, the problem will not be cured, as they will continue to draw moisture in. Rusting steel and iron fasteners. If the rising damp is extensive, structural damage can result. The photograph to the right shows a gap of approximately an inch between the stair and the skirting board. This is due to the sagging of the rotting floorboards that support the staircase. There is a danger that the floor will collapse completely. In addition, health problems can arise for those living in a damp property, such as allergies and respiratory illnesses cased by the growth of dust mites and molds. First, you have to find out where the moisture is coming from and how it is getting in. If the dampness begins at ground level or below, it may be that your damp proof course (DPC) may be faulty. If your property has suffered subsidence, it is possible that the DPC could have been damaged. Some older properties do not have a DPC at all, or if they do, a physical membrane may have failed or been bridged. To find out whether this is the case, you will need to make a more in depth investigation, but before you do so, it is best to eliminate all other possibilities first. Ground levels surrounding properties can rise over the years as garden debris accumulates, and home improvements like decking and driveways are added. Check the outside of your property to make sure that all surfaces are not carrying water to a level higher than that of your DPC. All surfaces abutting the walls of the property should be slightly sloped so that rainwater drains away from the building. If you have cavity wall insulation, check that this has been properly installed. It should not go below the level of the DPC. Broken or blocked guttering, drainpipes, roofing and flashing contribute greatly to damp, causing water to leak onto walls. Check that there are enough airbricks around all sides of the building and that they are not blocked. They should be positioned every 180cm (5ft 11in). Check the brickwork/rendering, etc., of your chimney for any damage to the waterproof surface. Check that kitchens, bathrooms and boilers are well ventilated to carry condensation away. Dehumidifiers work very well in removing moisture from the atmosphere. Check that waterproof sealant and grouting is intact in between walls and shower trays/bathtubs. Check pipework for leaks, particularly at joints. If damp is appearing in walls above a fireplace, it could be that hygroscopic salts are drawing moisture in. Once the source of moisture has been identified, the first thing to do is to remove it. Leaks and external rainwater goods like guttering and drainpipes need to be fixed. Good ventilation through rooms and beneath floors must be re-established, and all drainage issues addressed. It's only once the above issues have been addressed that a new damp proof course should be installed, if deemed necessary. After that, any remaining rotten internal woodwork should be removed and replaced, and walls repaired and redecorated. In today's construction world there is an increasing number of different technologies that are aimed at making our lives more convenient and economical. Now there are new species that take less time to build. Projects of casas campestres prefabricadas have been developed. And this is not surprising, because they have a lot of advantages. First of all, prefabricated houses are good at the speed of construction and quality assurance. Projects of these houses are created in accordance with all international standards and safety requirements. They are suitable for those who want to live in a safe and durable building.